5.7 Earthquake hits the Solomon Islands. 5.6 Earthquake hits the Solomon Islands. 5.3 Earthquake his the Bougainville Region, Papua New Guinea. Tropical cyclone Ita is located approximately 332 nm north-northwest of Brisbane, Australia. Australia – The Queensland sugar cane crop has been hard hit by Ita. Residents in Ingham will have to wait to assess the full damage, after the storm flattened sugar cane fields in the north. More than 27,000 homes and businesses remain without power in far north Queensland as the mop up from Cyclone Ita continues. USA – Tornado reported in Midwest US as storms roll across plains. Strong thunderstorms brought rain and hail from the southwestern U.S. and Plains states to the upper Midwest on Sunday — and at least one tornado. A large and moving forest fire kills at least 16 people in Chile’s port city of Valparaiso and forces more than 10,000 people to evacuate. 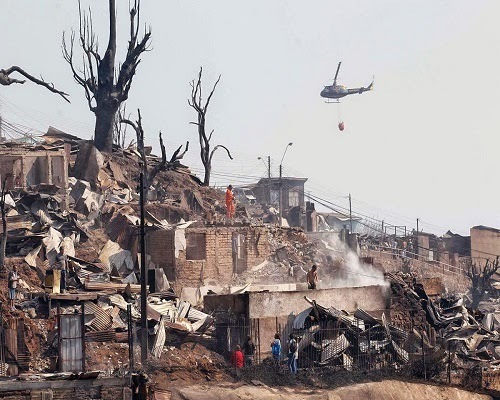 Reports of more than 2 000 homes destroyed. Some 1,200 firefighters are battling the large blaze, which has destroyed hundreds of homes since Saturday. 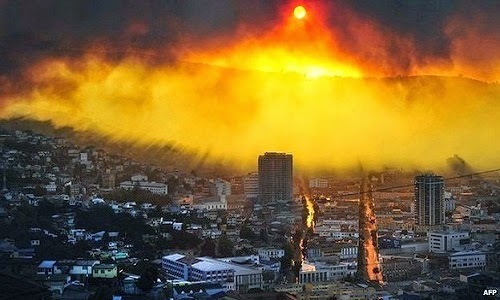 The city, 110km (70 miles) west of Santiago, was declared a disaster zone. Security forces are on the streets to maintain order and prevent looting. Earlier, the authorities said 16 residents had died, but it turned out that one family had been counted twice. One official said it was the “worst catastrophe” he had ever seen. The fire started on Saturday, and most of the damage was done overnight. Fires are frequent in central Chile, where summer sends temperatures soaring. On 11 April 2014, the National Health and Family Planning Commission (NHFPC) of China notified WHO of 4 additional laboratory-confirmed cases of human infection with avian influenza A(H7N9) virus. Karymsky (Kamchatka): (13 Apr) An eruption yesterday evening produced an ash plume that rose to estimated 14,000 ft (4.2 km) altitude. Dukono (Halmahera): (13 Apr) Ash plumes from stronger (probably strombolian-type) explosions are regularly spotted on satellite imagery by VAAC Darwin. The semi-permanently erupting volcano apparently continues to be in a relatively elevated phase of activity. Popocatépetl (Central Mexico): (13 Apr) A slight increase of activity (but no significant change) was reported by CENAPRED. During 11-12 April, the volcano had 120 exhalations of small to medium intensity, some of which have been followed by emissions of steam, gas and sometimes small amounts of ash. The most important of these were recorded yesterday morning at 02:19 and at 04:55 h (local time). The latter explosion threw some incandescent fragments to distances of approx. 100 m onto the upper eastern slope. Momotombo (Nicaragua): (13 Apr) Seismicity in the volcanic chain between Momotombo and Apoyeque volcanoes remains high. Dozends of shallow earthquakes in the magnitude 3-5 range have been occurring daily in a cluster SE of Momotombo and near Apoyeque. There are no reports of unusual activity at either volcano. Nyamuragira (DRCongo): News started to spread on twitter and other media that a new eruption of the volcano started today, including pictures from the 2010 eruption as (false) evidence. An overflight today by members of Nord-Kivu’s government showed only intense degassing from a pit crater (but no lava erupting), although they suggested that “an eruption is imminent”. While it is difficult to judge the situation from the current sources available, it seems that the eruption reports are a case of rumour spreading faster than actual evidence.